Every year, tons of people flock to Chilliwack. It is the gorgeous countryside that draws visitors in but what is the point if you can’t see it? Having a clear view is important to both commercial and residential properties. Transparency is key to making relationships and that is why our Gorillas lay it all on the line with our Chilliwack window cleaning. 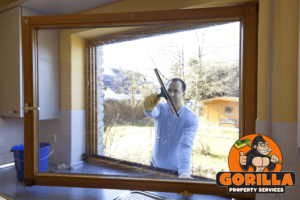 Cleaning windows is a common chore in most households but are you getting the best result? Proper window cleaning goes deeper than a clear surface. The most obvious sign that your windows are due for a cleaning is spots, stains, and dirt around glass and sills. On the ground level, it is easy to wipe these spaces but without the right technique, they won’t stay clear for long. The friction associated with wiping the surface of glass, creates a static shock along panes. This static shock attracts airborne materials, making them appear dirty soon after cleaning. Having dirt sitting on the surface of your windows might seem superficial but it can be more than that. Glass is a porous material, meaning that it does, in face, have pores! When dirt sits on top of glass, it can seep into these pores and begin to deteriorate glass from the inside out. This can lead to cracks, breaks, repairs or even the dreading replacement. If you maintain a healthy window cleaning routine, however, this can all be prolonged or avoided. Gorilla technicians approach your Chilliwack window cleaning in parts. By separating the process into steps, we can ensure a well-rounded clean for each and every piece of your window. Glass panes are cleaned either by hand or by water-fed poles. Our by-hand cleaning utilizes rubber squeegees and eco-friendly cleaners to wipe out every corner and angle of the glass. By choosing rubber over other materials, Gorillas eliminate the build-up of static electricity. Once windows are clean, frames and sills are wiped as well. This ensures windows are kept cleaner, longer, by removing dirt in close proximity to the glass. Monitoring the condition of sills and frames also allows our Gorilla technicians to identify any problem areas that can lead to degradation, leaks or drafts. Call today to speak with one of our highly trained Gorillas. We are free to answer any questions that you might have regarding your Chilliwack window cleaning.